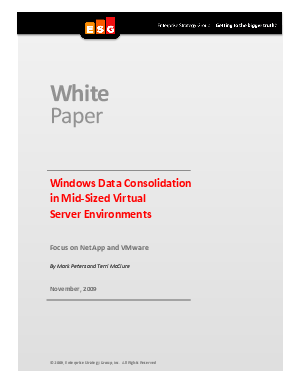 ESG Whitepaper talking about Windows Data Consolidation in Mid-Sized Virtual Server Environments. This paper focuses on the challenges of virtualizing Windows environments and the need to consider network storage as a part of the overall solution. NetApp and VMware's joint solution is also examined in detail.